Miley Cyrus has recently been in the spotlight of news, social media and internet memes over her recent VMA performance. While many people are laughing and sneering, feeling embarrassed for Miley or believing she has been subjected to horrific PR; I’m not entirely convinced. Miley’s PR team meticulously planned the moments leading up to the VMA’s, the performance itself and the days following. While it may have looked like Miley had a brain lapse on stage, stripping off her clothes and twerking, her brand manager has confirmed that those moves were carefully planned, practiced and perfected months before the VMA’s – from the frightening tongue gestures to the famous twerking. So why did Miley’s publicity team carefully plan a performance that would shock and outrage many of her fans? Let’s think back to Miley’s last year – she has been trying desperately to break free from her Disney girl branding. She cut her hair, got a few tattoos, wore some outrageous outfits and became engaged. Unfortunately for Miley her attempts to subtly rebrand weren’t enough to push out from her Hannah Montana image. For Miley, there was only one way to break free from Hannah Montana and get recognised for the person she truly is – create a publicity stunt that would shock and stun her Disney fans and get the world talking. I think it’s safe to say that both of those goals were ticked off the list. Miley’s VMA performance was all about virality. The performance was carefully staged to be tweetable and meme-able and the celebrity audience of the VMA’s was perfect for sending images and tweets on a mass capacity. Shortly after Miley’s VMA performance, Twitter blew up with 306,000 Miley-related tweets per minute. Miley also received 213,104 new Twitter followers in the hours following her performance. Celebrities such as Cyndi Lauper and Kelly Osbourne tweeted their thoughts to their fan base, further contributing to the virality of her performance. Hashtags such as #Twerk and #StayStrongBillyRay began trending. Vine has also exploded with twerk videos and I can’t count the amount of Miley meme’s I have seen on Facebook. 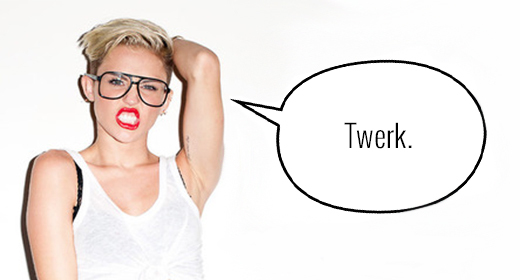 For Miley’s PR team, it doesn’t matter what people say, as long as they are talking. And here we are over two weeks later and we’re still talking. If you think the few last weeks have been pretty intense, be warned – the rebranding exercise hasn’t stopped yet. Like all successful publicity stunts, Miley’s PR team has used additional marketing and advertising of the VMA performance in support of the new Miley brand. Miley’s song ‘Wrecking Ball’ debuted the day of her VMA performance and has since sold over 90,000 digital downloads, not to mention being played constantly on the radio. YouTube has also been inundated with advertisements for Miley’s album and just the other day her new song with Justin Bieber and Lil Twist entitled ‘Twerk’ was leaked. Who knows what’s going to happen next? While the shock and awe factor is a dangerous road to travel when it comes to a publicity stunt, I must say, Miley has worn it well. She’s stuck to her new brand image, made no apologies and she’s gracefully embracing the good, the bad and the ugly backlash. Miley’s brand manager has also publically announced that her VMA performance “simply could not have gone better”. I commend Miley and her team for achieving their goals and getting the world talking. What do you think of Miley’s VMA publicity stunt? Would a more subtle approach have had the same viral effect?